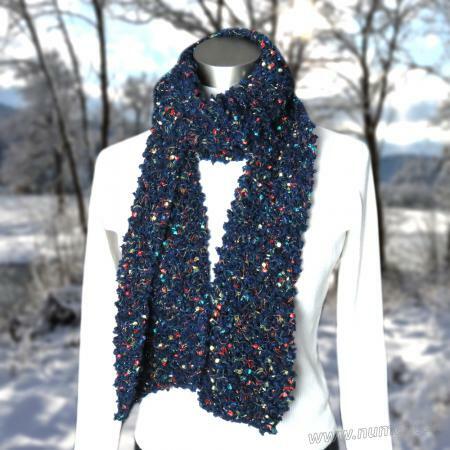 The little tufts on the Berlini Little Blossoms yarn give texture and the ladder yarn adds brilliant color to this easy to make scarf. It is soft and warm and takes no time at all to make! Knitted Measurements: Approx W8" x L57"
With both yarns held together, cast on 20 stitches. Knit every row, joining a new ball of yarn as each ball is used up. Knit until the final ball of Little Blossoms is used up, making sure to leave enough yarn to bind off on the last ball. Copyright 2017 NuMei - This pattern may be used for non-commercial personal or guild use. Reproduction in print in any publication or electronic/digital format without permission is strictly prohibited. Every effort has been made to ensure that the directions contained in this pattern are accurate and complete; However, we cannot be responsible for individual variance, human or typographical errors.